Lief of Arendaal ("The Black Prince") (1345 - 1387) was the Crown Prince of Arendaal and Crown Prince of Suionia between 1350 and his sudden death in 1387. He was the son of King Edvard II of Arendaal and Louise of Montelimar. 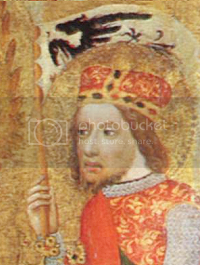 Lief was set to inherit both the Aren and Suionia crowns thanks to the Union of Bergen (1350-1424), a series of personal unions by which the Aren Kings also became Kings of the country's eastern neighbour. However, Lief predeceased his father by less than two years, and so never became King. The throne passed, instead, to his eldest daughter, Blanche I upon the death of Edvard II. Crown Prince Lief was the first Crown Prince of Arendaal to have the title of Prince of Fjordholm (a title which has been borne by all successive Heirs to the Aren throne including the current Crown Prince Soren of Arendaal). Lief was considered the embodiment of the chivalric knightly ideal during his lifetime. A talented soldier, he was also a pious man and cultivated prince. He was well educated for the time, a collector of books, and turned his own court as Prince of Fjordholm into a centre of learning. His piety and culture were celebrated, as was his interest in jousting tournaments and warfare, which made him a popular heroic figures to the Aren masses. An account of one envoy to the court of Lief's father records the "impressive nature of the Prince's person and piety". 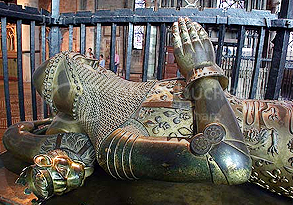 Although Lief has in later years often been referred to as the "Black Prince", there is no record of this name being used during his lifetime. He was instead known as "Lief of Kronstad", after his place of birth, or "Lief of Fjordholm" given his title of Prince of Fjordholm. The "Black Prince" sobriquet is first found in the 16th century. Its origin is uncertain. It has been suggested that it is a reference to his characteristic black armour, or to the emblem of his banner: a black eagle. In searching for a suitable wife for himself, Lief was adamant that his father procure a bride who was not a blood relation. 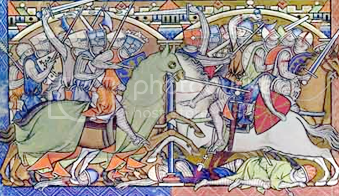 The search caught the imagination of chroniclers and poets of the age, who promptly turned it into a tale of a 'knightly quest'. Some asserted that the Prince wanted to marry a commoner, but knowing his father would never allow this, devised a means of avoiding marriage to anyone else: namely, the grounds of consanguinity. The Aren Royals were related by blood to nearly every other Royal House in Europe and finding an eligible princess unrelated to them was a monumental task. Historians point out that there exists to proof of Lief's choice having been a technique to avoid marriage. In fact he was opposed to marriages within close degrees of kinship (for instance he approved of the marriage of his daughter Blanche to the much older Karl August of Saxony but prevented the proposed match between Blanche and her first cousin, i.e. Karl August's nephew). After many years of searching, Lief finally married Martha of Anglyn, the first royal match between the Kingdoms of Arendaal and Anglyn. Lief died suddenly early in 1387 after a short illness that lasted only a few days. His death stunned the Kingdom. His father, King Edvard II of Arendaal, is said to have never recovered from the shock. Lief's sudden demise is thought to have contributed to Edvard's own failing health and death in 1388. The crowns of Arendaal and Suionia passed to Lief's daughter Blanche I when King Edvard II died. 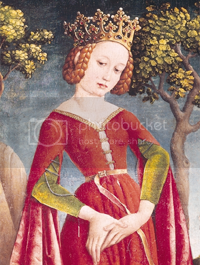 Catharina of Batavie, Queen of Arendaal - step-mother (father's second wife).